Good friends Fournier, Maki guide Moose to Michigan for April tournament. Esa Maki skates off the ice during practice for a game he’s starting, and Derek Fournier is waiting with advice. Fournier sits in the locker room during an intermission, and Maki is ready with a joke. 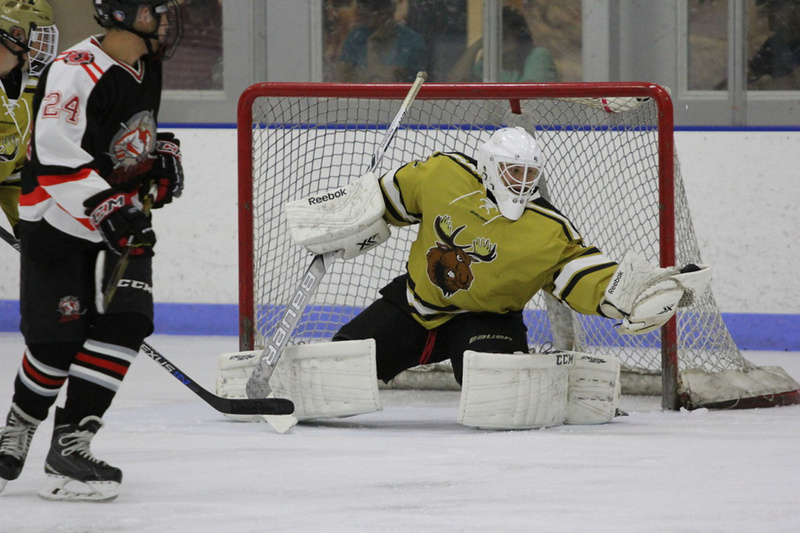 So it goes at the goaltender position for the Maine Moose 18U hockey team, where Fournier and Maki balance a drive for playing time and exposure with one of the team’s strongest friendships. The two have combined to backstop the Moose through a 34-1 season, one that included victory in the MEAHA state tournament in November for a berth in the Youth Tier II national championships in Lansing, Michigan in April. For most of the players on the team it’s a chance for a repeat, as the core of the 18U team won the 16U national championship in New Jersey last year, and will appear in its fourth straight national tournament this year. There are few positions they’re better stocked at than in net. 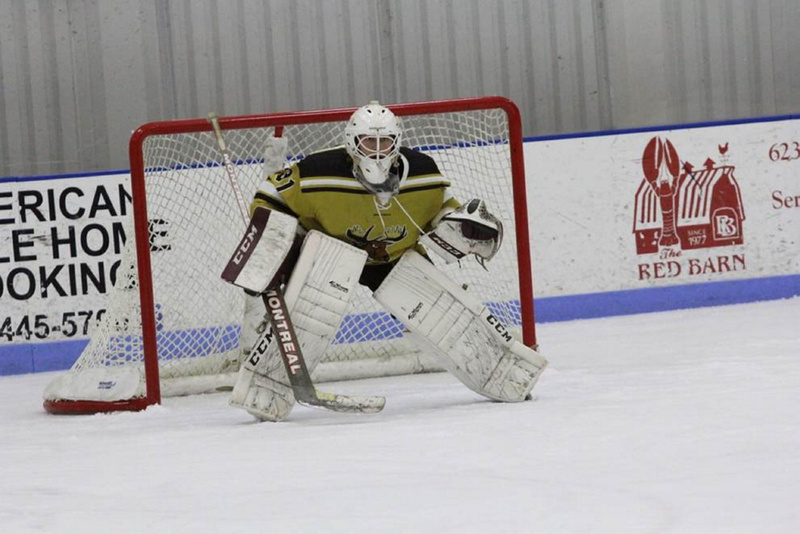 Maki, a senior at Kents Hill School, is the goalie that guided the Moose to the championship last year and who’s on the radar of the Topeka RoadRunners of the North American Hockey League, USA Hockey’s second-highest junior hockey organization. Fournier, a new addition out of Bangor, was drafted by the Saint John Sea Dogs of the Quebec Major Junior Hockey League, one of the three making up the prestigious Canadian Hockey League, the top producer of players for the NHL. Their ties extend beyond their development into bona fide hockey prospects. Maki and Fournier have known each other since childhood, and though they were always on different teams — Maki landing with the Moose, Fournier playing for the Maine Freeze — youth hockey is an interlinked world, and they frequently crossed paths at youth games, events and tournaments. They finally became teammates when Gray persuaded Fournier to join up. Fournier wanted to boost his name in hockey circles, and Gray was eager to add to the championship formula. Ross found ways to let both of his goalies shine. Maki and Fournier split games, which in turn prevented any fatigue from building up. If the team had games on Saturday and Sunday, Maki would get one, Fournier would get the other. If the team played twice in one night, one got the early game, one got the nightcap. That meant sharing the role, and with it, chances to further bolster their name for interested programs and coaches. And the goalies loved it. The two maintained a supportive relationship throughout. Friendship is one thing, but each knew how important it was for the other to play well to keep the team’s goals alive. The dynamic was challenged when Maki was summoned by the RoadRunners as an emergency substitute at the start of the playoffs. That left Fournier as the lone starter, and though Maki returned before the tournament’s end, Ross stayed with the hot hand and Fournier, who guided the Moose to a 5-0 record and the title while surrendering only four goals. The decision wasn’t easy for Maki, who was eager to play and help lead the team with which he had won a national championship just a year earlier. That was the impression Fournier and his coaches got. In the biggest tournament of the season, the friendship remained strong. The story isn’t over. There’s still the national tournament ahead, and Ross made himself clear. Fournier will play. And Maki will too. Then there’s the future. Maki hopes to play for Topeka next year after spending just over a week there in November, with the goal of eventually playing in college. Fournier doesn’t intend to play in the QMJHL, since his primary goal is college hockey and joining Saint John would end his eligibility. Still, he knows draft stock in one of Canada’s top leagues isn’t a bad way to separate your name from the ranks. That can wait, though. There’s still a national tournament, come the spring, to think about. No matter who’s in net.